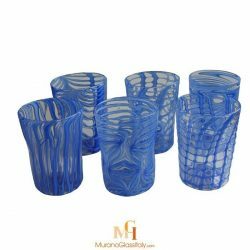 The Murano Murrine Collection was created by Formentello Murano Glass Furnace, an old Venetian Murano glass manufacturer. Angelo and his brother are the second generation glass masters of the founding Formentello family. They are specialized on creating colourful and playful handcrafted masterpieces with a unique technique. Murrine is an Italian art term for patterns made in glass. Each murine is made by layering different colours of molten glass creating a glass cane, which then are cut in cross-sections to reveal the beautiful colours of the murrine. The displayed vases, plates and glasses are created through different combinations of murrine by the expert hands of the glass masters. Therefore all articles which are part of the Colourful Murrine Italian Art Collection are truly unique creations.